The Answer of Edward Edgworth Esquire, to the Appeal of Packington Edgworth Gentleman and Mary Edgworth Spinster, was brought in. Ashworth against Chopping & al. Ordered, That the Cause wherein William Ashworth is Appellant, and Richard Choppin and others are Respondents, which stands to be heard this Day, be put off to Monday next; and the other Causes removed in Course. 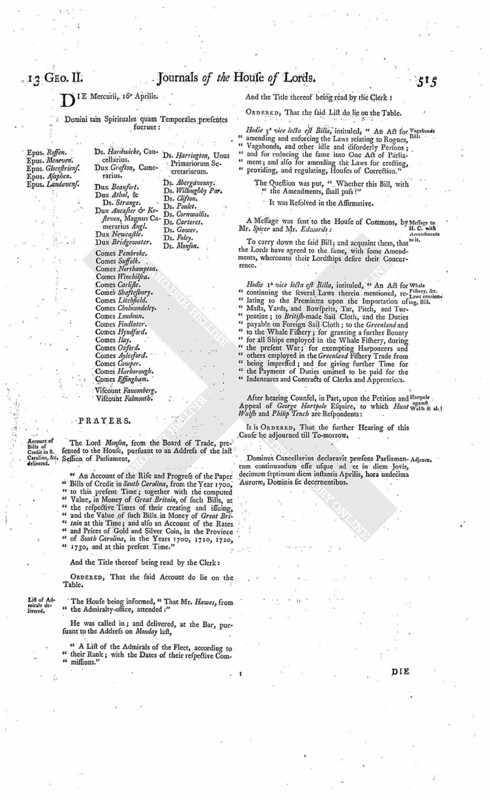 It is Ordered and Adjudged, by the Lords Spiritual and Temporal in Parliament assembled, That the said Decree be, and the same is hereby, reversed: And it is hereby Declared, That the Articles of Agreement, made the 15th of March 1714, between Mac Laughlin Donnellan of the One Part, and Luke Dillon Esquire, deceased, and the Appellant, of the other Part, were performed and executed, by the said Luke Dillon's having given the Statute Staple mentioned in the Decree, with the Appellant's Consent, she being Party to the Defeazance of the 8th of October 1715, in the Decree also mentioned; and that the said Statute Staple ought not to be considered as a collateral Security: And it is therefore further Ordered and Adjudged, That the Respondent's Bill in the said Court be, and the same is hereby, dismissed. The Earl of Findlater reported from the Lords Committees to whom the Bill, intituled, "An Act for dividing and enclosing the Common Fields, in the Parish of Stivichall, alias Stichall, in the County of the City of Coventry," was committed: "That they had considered the said Bill, and examined the Allegations thereof, which they found to be true; that the Parties concerned had given their Consents; and that the Committee had gone through the Bill, and directed him to report the same to the House, without any Amendment." Dominus Cancellarius declaravit præsens Parliamentum continuandum esse usque ad et in diem Lunæ, decimum quartum diem instantis Aprilis, hora undecima Auroræ, Dominis sic decernentibus. To return the Bill, intituled, "An Act for vesting the Inheritance of Part of the Estate of George late Earl of Halifax, deceased, in Trustees, for Payment of his Debts, Daughters Portions, and Legacies;" and to acquaint this House, that they have agreed to the same, without any Amendment. To return the Bill, intituled, "An Act for enclosing and dividing the Common Fields, Common Pastures, and Waste Grounds, lying within the Manor and Township of Gunnerton, in the County of Northumberland;" and to acquaint this House, that they have agreed to the same, without any Amendment. To return the Bill, intituled, "An Act for exchanging several Lands and Grounds, belonging to Thomas Inwen Esquire, in the Parish of Wootton, in the County of Bedford, for other Lands, of equal Value, in the same Parish, belonging to the Master, Fellows, and Scholars, of Sidney Sussex College, in Cambridge;" and to acquaint this House, that they have agreed to the same, without any Amendment. No more Causes to be heard this Session, than the Three appointed. Ordered, That no more Causes, after this Day, than the Three next appointed in Course, be heard this Session of Parliament. Counsel appeared for the Respondents; but none for the Appellant. It is Ordered and Adjudged, by the Lords Spiritual and Temporal in Parliament assembled, That the said Appeal be, and is hereby, dismissed this House; and that the said Decree therein complained of be, and the same is hereby, affirmed. Lords Reasons for insisting on Amendments to the Bill for prohibiting Commerce with Spain. "Because their Lordships apprehend, that, should there be a Liberty granted of importing into His Majesty's Dominions any Goods or Commodities of the Growth or Product of Spain, till the First of June next, it would be a great Prejudice to this Kingdom, since an Opportunity may be thereby given of importing large Quantities of Goods contracted for after the Prohibition of Commerce on the Part of Spain, and which must therefore be paid for in ready Money; whereby the Balance of Trade will be turned to the Prejudice of Great Britain, and great Advantages will arise to the King of Spain and his Subjects, during the Time of actual War with that Crown, which will, as the Lords conceive, be in a great Measure prevented by the said Amendment. "The Lords do not insist on their Third Amendment, in Press 2. Line 2. of the said Bill, whereby the Word ["Foreign"] is directed to be inserted before the Word ["Port"], to which the Commons disagree. "Because it did appear to their Lordships, by the Account given by the Merchants at their Bar, that almost all the Effects of the English Merchants, contracted for in Spain, were either in Minorca, Gibraltar, or at Sea, in their Way to England, on or before the 26th Day of February last, the Time limited by the said Clause for the Arrival of such Goods at Minorca or Gibraltar: And their Lordships conceive, that no Inconvenience can arise, by indulging the Merchants to the 24th of June, for bringing Home such Goods, since, by the said Clause, they are required to make Proof that the said Goods were actually imported into Minorca or Gibraltar, and there landed, or loaded on Board some British Ship or Vessel, on or before the said 26th Day of February; and the Method prescribed for making such Proof is agreeable to what hath been formerly practised in Cases of the like Nature, except that in this Case the Proof is, for the greater Security, required to be made before the Commissioners of the Customs, instead of the Barons of the Exchequer; but no greater Difficulty will be thereby occasioned to the Importers who do not live in or about the Cities of London and Westminster, than was thought reasonable in the Act 3o and 4o Annæ, Cap. 13. Sect. 3.; and besides, it will be very practicable for them to send up their Proofs, to be produced and laid before the Commissioners of the Customs. "For these Reasons above-mentioned, the Lords apprehend that no Inconvenience can happen from the said Clause, and from the Prohibitions not absolutely taking Place in all His Majesty's Dominions at the same Time." Ordered, That the said Reasons be delivered to the Commons, at a Conference. The Messengers, being returned, acquainted the House, That the Commons will give a present Conference, as desired." Ordered, That the Committee appointed to draw Reasons to be offered to the Commons be the Managers of this Conference. And the Duke of Bedford reported, "That the Lords had met the Managers for the Commons at the Conference, and communicated to them their Lordships Reasons, as directed; and left the Bill and Amendments with them." 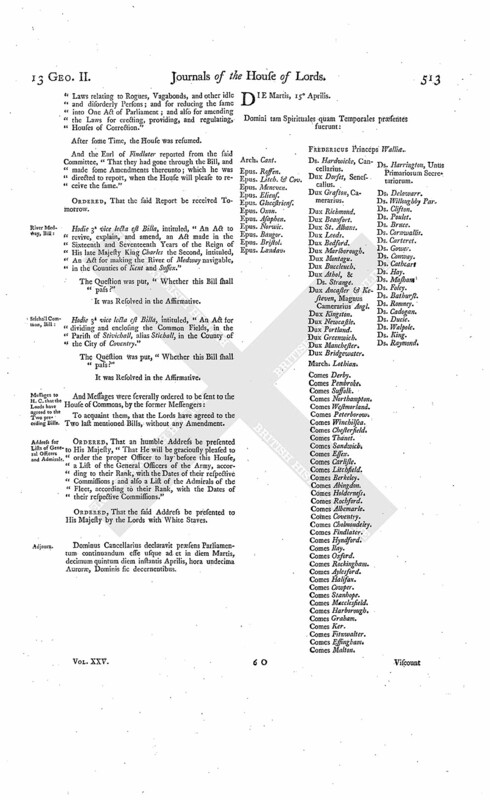 The House (according to Order) was adjourned during Pleasure, and put into a Committee upon the Bill, intituled, "An Act for amending and enforcing the Laws relating to Rogues, Vagabonds, and other idle and disorderly Persons; and for reducing the same into One Act of Parliament; and also for amending the Laws for erecting, providing, and regulating, Houses of Correction." And the Earl of Findlater reported from the said Committee, "That they had gone through the Bill, and made some Amendments thereunto; which he was directed to report, when the House will please to receive the same." Hodie 3a vice lecta est Billa, intituled, "An Act to revive, explain, and amend, an Act made in the Sixteenth and Seventeenth Years of the Reign of His late Majesty King Charles the Second, intituled, An Act for making the River of Medway navigable, in the Counties of Kent and Sussex." Hodie 3a vice lecta est Billa, intituled, "An Act for dividing and enclosing the Common Fields, in the Parish of Stivichall, alias Stichall, in the County of the City of Coventry." Address for Lists of General Officers and Admirals. Ordered, That an humble Address be presented to His Majesty, "That He will be graciously pleased to order the proper Officer to lay before this House, a List of the General Officers of the Army, according to their Rank, with the Dates of their respective Commissions; and also a List of the Admirals of the Fleet, according to their Rank, with the Dates of their respective Commissions." Dominus Cancellarius declaravit præsens Parliamentum continuandum esse usque ad et in diem Martis, decimum quintum diem instantis Aprilis, hora undecima Auroræ, Dominis sic decernentibus. King's Answer to Address for Lists of Officers. The Earl Fitzwalter acquainted the House, "That the Lords with White Staves had (according to Order) presented to His Majesty the Address of Yesterday, for Lists of the General Officers of the Army, and of the Admirals of the Fleet, according to their Ranks, with the Dates of their respective Commissions; and that His Majesty was pleased to say, "He would give Order to the proper Officer, that the said Lists should be laid before this House, as soon as the same could be conveniently got ready." The Earl of Findlater (according to Order) reported from the Committee of the whole House to whom the Bill, intituled, "An Act for amending and enforcing the Laws relating to Rogues, Vagabonds, and other idle and disorderly Persons; and for reducing the same into One Act of Parliament; and also for amending the Laws for erecting, providing, and regulating, Houses of Correction," was committed, the Amendments made by the Committee to the said Bill. "Press 8. Line 30. Leave out the 2d ["of"]. "10. L. 22. Leave out ["to"]. "11. L. 1. Leave out the First ["and"]. "14. L. 39. After ["But"], insert ["whereas"]. "15. L. 2. Leave out ["whereof"], and insert ["thereof"]. "L. 46. After ["Overseer"], insert ["of the Poor"]. "18. L. 35. After ["Board"], insert ["in order to be carried"]." Messages from H. C. with a Bill; and to return Talbot's Bill. To return the Bill, intituled, "An Act for selling Part of the settled Estate of Henry Talbot Esquire, in the Counties of Warwick and Derby; and for settling another Estate, in the County of Rutland, of greater Value, to the same Uses;" and to acquaint this House, that they have agreed to the same, without any Amendment. 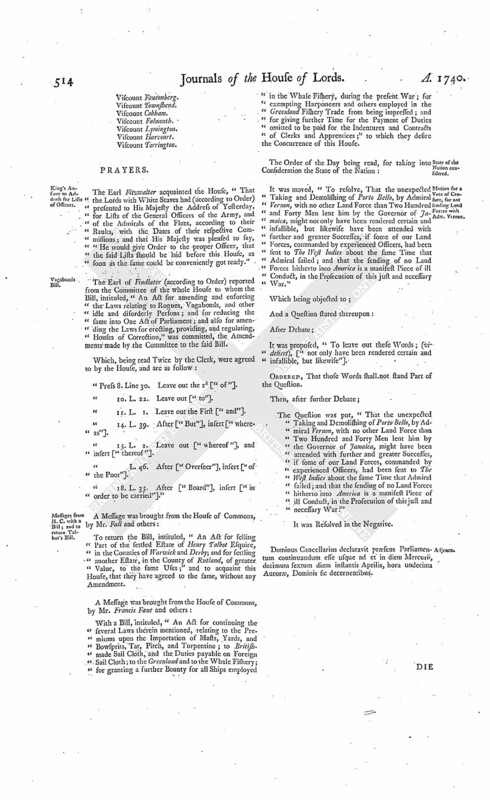 With a Bill, intituled, "An Act for continuing the several Laws therein mentioned, relating to the Premiums upon the Importation of Masts, Yards, and Bowsprits, Tar, Pitch, and Turpentine; to Britishmade Sail Cloth, and the Duties payable on Foreign Sail Cloth; to the Greenland and to the Whale Fishery; for granting a further Bounty for all Ships employed in the Whale Fishery, during the present War; for exempting Harponeers and others employed in the Greenland Fishery Trade from being impressed; and for giving further Time for the Payment of Duties omitted to be paid for the Indentures and Contracts of Clerks and Apprentices;" to which they desire the Concurrence of this House. State of the Nation considered. Motion for a Vote of Censure, for not sending Land Forces with Adm. Vernon. It was moved, "To resolve, That the unexpected Taking and Demolishing of Porto Bello, by Admiral Vernon, with no other Land Force than Two Hundred and Forty Men lent him by the Governor of Jamaica, might not only have been rendered certain and infallible, but likewise have been attended with further and greater Successes, if some of our Land Forces, commanded by experienced Officers, had been sent to The West Indies about the same Time that Admiral sailed; and that the sending of no Land Forces hitherto into America is a manifest Piece of ill Conduct, in the Prosecution of this just and necessary War." It was proposed, "To leave out these Words; (videlicet), [" not only have been rendered certain and infallible, but likewise"]. Ordered, That those Words shall not stand Part of the Question. The Question was put, "That the unexpected Taking and Demolishing of Porto Bello, by Admiral Vernon, with no other Land Force than Two Hundred and Forty Men lent him by the Governor of Jamaica, might have been attended with further and greater Successes, if some of our Land Forces, commanded by experienced Officers, had been sent to The West Indies about the same Time that Admiral sailed; and that the sending of no Land Forces hitherto into America is a manifest Piece of ill Conduct, in the Prosecution of this just and necessary War?" Dominus Cancellarius declaravit præsens Parliamentum continuandum esse usque ad et in diem Mercurii, decimum sextum diem instantis Aprilis, hora undecima Auroræ, Dominis sic decernentibus. Account of Bills of Credit in S. Carolina, &c. delivered. "An Account of the Rise and Progress of the Paper Bills of Credit in South Carolina, from the Year 1700, to this present Time; together with the computed Value, in Money of Great Britain, of such Bills, at the respective Times of their creating and issuing, and the Value of such Bills in Money of Great Britain at this Time; and also an Account of the Rates and Prices of Gold and Silver Coin, in the Province of South Carolina, in the Years 1700, 1710, 1720, 1730, and at this present Time." 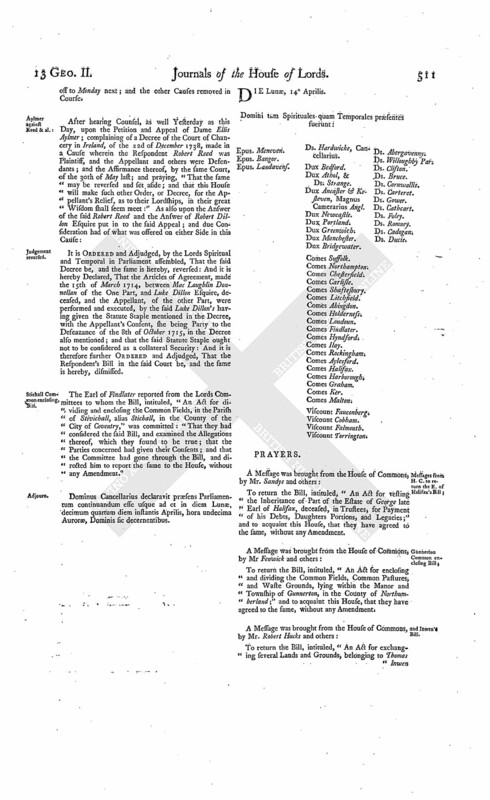 The House being informed, "That Mr. Hawes, from the Admiralty-office, attended:"
"A List of the Admirals of the Fleet, according to their Rank; with the Dates of their respective Commissions." Ordered, That the said List do lie on the Table. Hodie 3a vice lecta est Billa, intituled, "An Act for amending and enforcing the Laws relating to Rogues, Vagabonds, and other idle and disorderly Persons; and for reducing the same into One Act of Parliament; and also for amending the Laws for erecting, providing, and regulating, Houses of Correction." Whale Fishery, &c. Laws continuing, Bill. Hodie 1a vice lecta est Billa, intituled, "An Act for continuing the several Laws therein mentioned, relating to the Premiums upon the Importation of Masts, Yards, and Bowsprits, Tar, Pitch, and Turpentine; to British made Sail Cloth, and the Duties payable on Foreign Sail Cloth; to the Greenland and to the Whale Fishery; for granting a further Bounty for all Ships employed in the Whale Fishery, during the present War; for exempting Harponeers and others employed in the Greenland Fishery Trade from being impressed; and for giving further Time for the Payment of Duties omitted to be paid for the Indentures and Contracts of Clerks and Apprentices. Dominus Cancellarius declaravit præsens Parliamentum continuandum esse usque ad et in diem Jovis, decimum septimum diem instantis Aprilis, hora undecima Auroræ, Dominis sic decernentibus. Hodie 2a vice lecta est Billa, intituled, "An Act for continuing the several Laws therein mentioned, relating to the Premiums upon the Importation of Masts, Yards, and Bowsprits, Tar, Pitch, and Turpentine; to British made Sail Cloth, and the Duties payable on Foreign Sail Cloth; to the Greenland and to the Whale Fishery; for granting a further Bounty for all Ships employed in the Whale Fishery during the present War; for exempting Harponeers and others employed in the Greenland Fishery Trade from being impressed; and for giving further Time for the Payment of Duties omitted to be paid for the Indentures and Contracts of Clerks and Apprentices." To return the Bill, intituled, "An Act for confirming and enlarging the Powers granted by His Majesty to the Governors and Guardians of the Hospital for the Maintenance and Education of exposed and deserted young Children, by His most Gracious Charter, bearing Date the Seventeenth Day of October in the Year of our Lord One Thousand Seven Hundred and Thirty-nine, and to enable them to execute the good Purposes of the said Charter;" and to acquaint this House, that they have agreed to the same, with some Amendments, to which they desire their Lordships Concurrence. Ordered, That the said Amendments be taken into Consideration To-morrow. It is Ordered and Adjudged, by the Lords Spiritual and Temporal in Parliament assembled, That the said Appeal be, and is hereby, dismissed this House; and that the said Order therein complained of be, and the same is hereby, affirmed. Free Conference on the Bill to prevent Commerce with Spain. To desire a Free Conference with this House, upon the Subject-matter of the last Conference. And the Messengers were called in; and acquainted by the Lord Chancellor, "That the Lords do agree to a Free Conference, as is desired; and appoint the same on Tuesday next, at Two o'Clock, in the Painted Chamber." 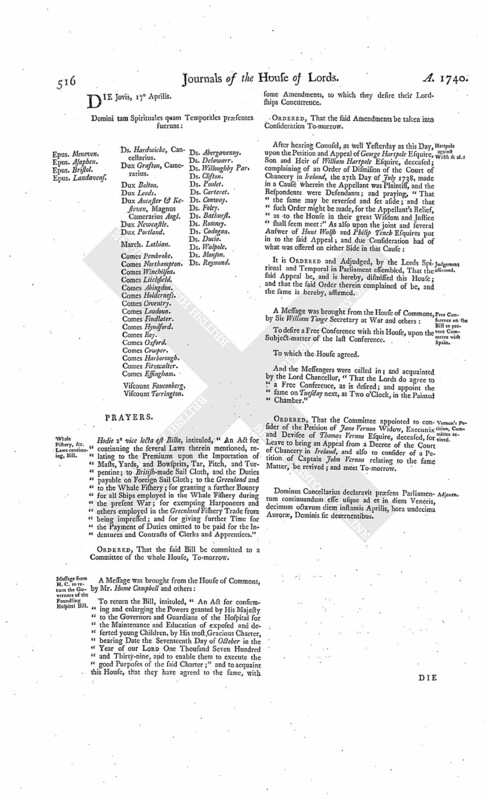 Ordered, That the Committee appointed to consider of the Petition of Jane Vernon Widow, Executrix and Devisee of Thomas Vernon Esquire, deceased, for Leave to bring an Appeal from a Decree of the Court of Chancery in Ireland, and also to consider of a Petition of Captain John Vernon relating to the same Matter, be revived; and meet To-morrow. Dominus Cancellarius declaravit præsens Parliamentum continuandum esse usque ad et in diem Veneris, decimum octavum diem instantis Aprilis, hora undecima Auroræ, Dominis sic decernentibus. Respondents to Nagle's Appeal to be paid Costs. A Petition of Penelope Purdon Widow, Relict, Executrix, and a Legatee and Devisee of the last Will and Testament, of Henry Purdon (late His Majesty's Serjeant at Law in His Kingdom of Ireland) deceased; and of Courthope Clayton Esquire, Executor after the Marriage or Death of the said Penelope Purdon, and Residuary Legatee and Devisee of the said Will, was presented to the House, and read; setting forth, "That, on the 12th of March last, an Appeal of Joseph Nagle, from certain Proceedings of the Court of Exchequer in Ireland (to which the Petitioners, upon their Application, were made Respondents) was heard, and the said Appeal dismissed, with Fifty Pounds Costs; and that the Appellant, being served with the Order of this House for Payment thereof, refused the same; insisting, That one Foot, the Original Respondent to the said Appeal, ought to have all or some Part thereof;" and praying, "In regard the said Foot made no Defence, nor so much as appeared to pray any Costs, the Petitioners only appearing, that the said Appellant may be obliged to pay the Petitioners, or their Agent, the said Costs." And thereupon the Petitioners Agent and the Agent for the Appellant were called in, and heard at the Bar. Ordered, That the said Fifty Pounds, for Costs, be paid by the Appellant to the Petitioners, for their Costs in respect of the said Appeal. Governors of Foundling Hospital, Bill. 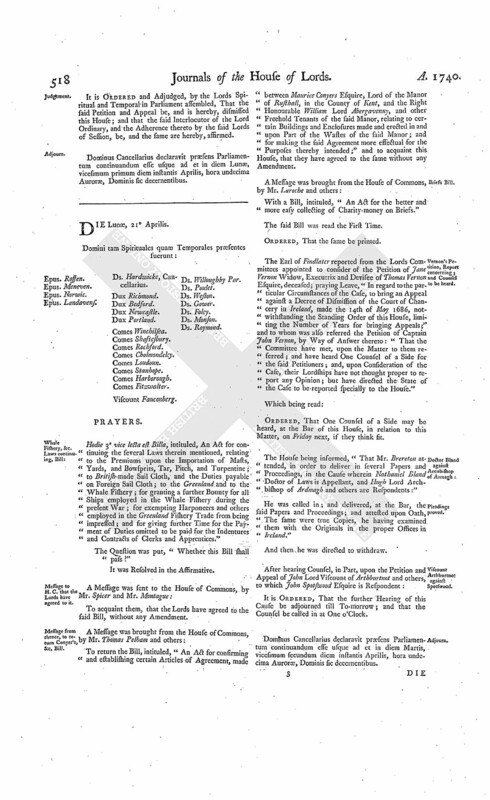 The House (according to Order) proceeded to take into Consideration the Amendments made by the Commons to the Bill, intituled, "An Act for confirming and enlarging the Powers granted by His Majesty, to the Governors and Guardians of the Hospital for the Maintenance and Education of exposed and deserted young Children, by His most Gracious Charter, bearing Date the Seventeenth Day of October in the Year of our Lord One Thousand Seven Hundred and Thirty-nine; and to enable them to execute the good Purposes of the said Charter." 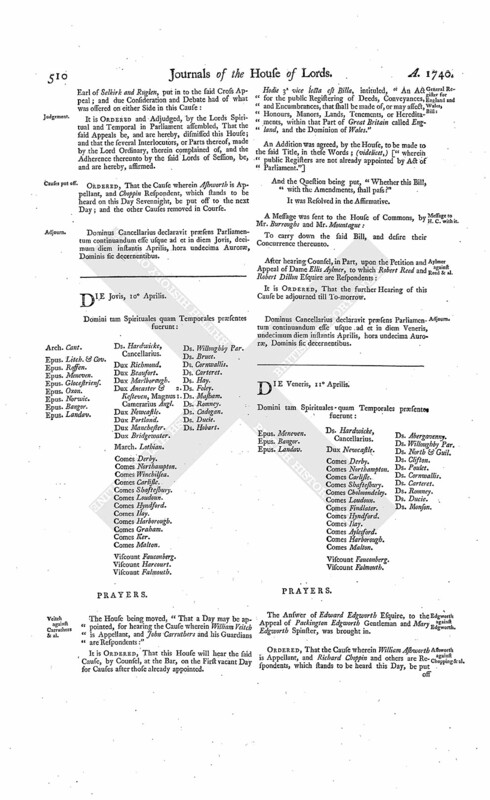 And the same, being read, were all of them agreed to, except that in the 21st Line of the 7th Press; which was agreed to, with the following Amendment, relating to Notice to be given in The Gazette, of the Meeting of the said Governors and Guardians; (videlicet), leave out ["or"], and instead thereof insert ["and also, (in case the said Governors and Guardians present at any Meeting, or the major Part of them, shall so direct) in any"]. To acquaint them, that the Lords have agreed to the Amendments made by them to the said Bill, with an Amendment to One of their said Amendments; to which their Lordships desire their Concurrence. 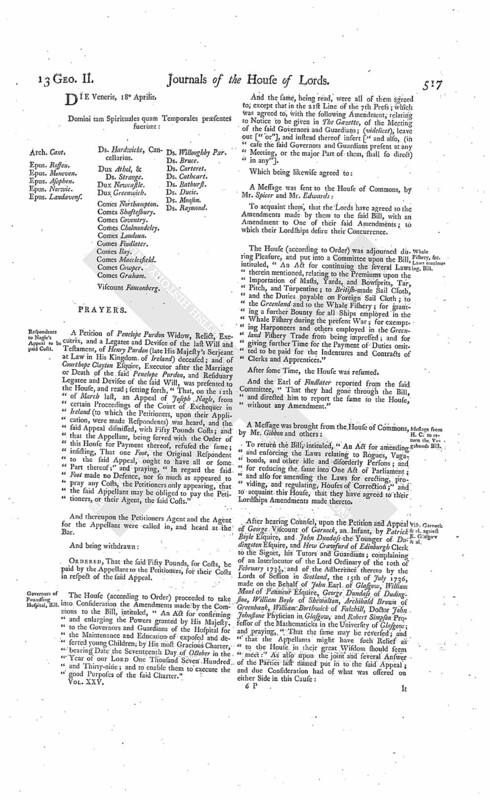 The House (according to Order) was adjourned during Pleasure, and put into a Committee upon the Bill, intituled, "An Act for continuing the several Laws therein mentioned, relating to the Premiums upon the Importation of Masts, Yards, and Bowsprits, Tar, Pitch, and Turpentine; to British-made Sail Cloth, and the Duties payable on Foreign Sail Cloth; to the Greenland and to the Whale Fishery; for granting a further Bounty for all Ships employed in the Whale Fishery during the present War; for exempting Harponeers and others employed in the Greenland Fishery Trade from being impressed; and for giving further Time for the Payment of Duties omitted to be paid for the Indentures and Contracts of Clerks and Apprentices." Message from H. C. to return the Vagabonds Bill. 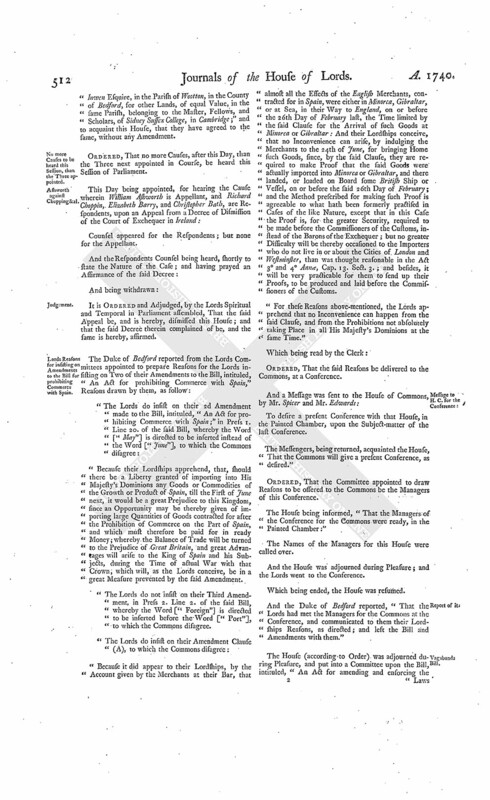 To return the Bill, intituled, "An Act for amending and enforcing the Laws relating to Rogues, Vagabonds, and other idle and disorderly Persons; and for reducing the same into One Act of Parliament; and also for amending the Laws for erecting, providing, and regulating, Houses of Correction;" and to acquaint this House, that they have agreed to their Lordships Amendments made thereto. Visc. Garnock & al. against E. Glasgow & al. It is Ordered and Adjudged, by the Lords Spiritual and Temporal in Parliament assembled, That the said Petition and Appeal be, and is hereby, dismissed this House; and that the said Interlocutor of the Lord Ordinary, and the Adherence thereto by the said Lords of Session, be, and the same are hereby, affirmed. Dominus Cancellarius declaravit præsens Parliamentum continuandum esse usque ad et in diem Lunæ, vicesimum primum diem instantis Aprilis, hora undecima Auroræ, Dominis sic decernentibus.